Ted Cruz has told Marco Rubio and John Kasich to drop out of the Republican Party's presidential contest as not to allow Donald trump run away with the nomination. Cruz's demand to the two contenders came after the election results on Saturday that showed Trump's victory in Louisiana and Kentucky, while he won in Kansas and Maine. Cruz's request to his co-contestants means that even with his own victory in two states on Saturday, their ganging up against Trump and Mitt Romney's moral declaration of war on the billionaire contestant is fart from achieving their objective. And it is uncertain that if Rubio and Kasich drop out that the gain will not go to Trump. 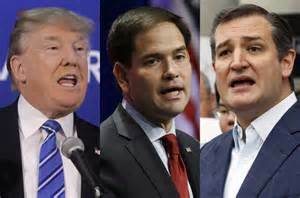 Trump has also asked Rubio and Kasich to get out and leave with him Cruz, one on one. Rubio has become inconsequential. The expectation on Saturday was that with Romney's war on Trump and the ganging together of Cruz and Rubio, backed by faceless billionaire financiers, is that Trump's momentum will be greatly dimmed. When the Kansas' results came, news analysts were agog, believing that Trump had begun to under perform, and that the Rubio and and Cruz attacks on him had started yielding results. One analyst, said to have been a speech writer to President George Bush Snr.,spoke about the input of financiers who are working with Trump's accusers to take the nomination away from him. But when Trump's victory in Louisiana and Kentucky came, the tone of the discussion changed. Even with Trump's victory in two states, his accusers think he should have performed better than he did with no explanation. Have they expected him to win all the four states or three of the four states? Why did they, when Trump had not folded the hands of other contestants? From the beginning of the race, Cruz won Iowa, where Trump came second and later he won New Hampshire and South Carolina in separate contests. And on the first Super Tuesday, Trump won seven states and Cruz won three and Rubio won one. No one would have expected Trump to win two states on Saturday with all the oppositions against him, but he won two and Cruz won two. The only contestant with a cry that he is the only conservative and the only Reagan Conservative and the only one capable of defeating Hillary Clinton in the general election and who has not performed to expectation is Rubio. And because of Rubio's poor performance, the Republican bigwigs appear to be abandoning him to embrace Cruz, who they also don't like, because Cruz has also been a torn in the flesh of the Republican Party's establishment. The picture right now is like the establishment is fighting an uncertain battle, all because they don't want to lose control of the party to a man they cannot control. Romney said that people thanked him for coming out against Trump, while he was doing the rounds in television houses to tar Trump toward slowing down his momentum, but slowing that did not happen. It is not strange that Cruz won two states, just like it is not strange that Bernie Sanders won two of the three states in the Democratic Party's contest and Clinton won one. Sanders' note on Saturday in one of his campaign statements about the influence of billionaires on America's democracy, which he said has consequently turned the country's democracy into an Oligarchy must not escape our attention and that it also relates to the current war in the Republican Party to influence the party's nomination at all cost.